Liverpool could easily have won the 2013-14 season of the Barclay’s Premier League, even discounting the early season home loss the Southampton, the away loss to Hull City and the home draw with Aston Villa in mid-season. These were matches when the Reds were having bad days in the office; as indeed every team is entitled to these. Most people will remember Gerrard’s slip leading to the disappointing 0-2 loss at home to Chelsea and the colossal collapse at Selhurst Park against Crystal Palace as the turning points that handed the title to Manchester City; but these both came at a crucial stage in the season when the team was crumbling under the sort of pressure it had not previously encountered. Instead, what ultimately cost Liverpool the title were performances earlier in the season when the pressure was still not as intense. I had always feared that it was asking too much of the team to put together a 14-game streak leading to the run in; and that the team would have been better served had the streak started two or three games later. A Liverpool defence responsible for preserving three straight 1-nil wins over Stoke City, Aston Villa and Manchester United was unlocked within 87 seconds by – who else – ex-Liverpool player Jonjo Shelvey. Despite the setback, the Reds actually took a 2-1 lead before the sort of criminal defending that would plague them all season long would wield itself again to allow Michu an equaliser for the Swans. Despite the draw, Liverpool still returned to the top of the table; but this was still clearly two points dropped. A languid, almost disinterested performance by Liverpool, particularly in the first half, saw the Reds come away from St. James Park with an almost undeserved 2-all draw. Newcastle twice led at home, the second time after Yanga-Mbiwa had been sent off to reduce the Toons to ten men. The game was there for the taking, but Liverpool had to huff and puff just to get the equaliser. At this point, the Reds had slipped to third with 20 points, 2 points behind Arsenal. Liverpool were leading 2-1 when Joe Allen missed a chance from ten yards in what is rudely called a sitting duck. Had Allen scored, the goal would have changed the complexion of the match and Liverpool would have been more relaxed from having a 2-goal cushion. As things happened, it was Everton who stormed to a 3-2 lead before Daniel Sturridge stole in for an equaliser very late in the game. At this point, Liverpool were second in the table, equal on points with Chelsea and four points behinds leaders Arsenal. Liverpool topped the table at Christmas courtesy of a glorious run that saw them hammer Norwich, West Ham, Spurs and Cardiff; but a visit to the Etihad to play eventual champions Manchester City was always going to be tricky. Critics of Liverpool’s porous defence correctly pointed at Simon Mignolet’s schoolboy error that led to the winner as the game’s most significant moment. However, Liverpool had led 1-nil to Philippe Coutinho’s opener and had a Raheem Sterling goal mystifyingly called offside. The Reds, at the very least, deserved at least a draw. Had Sterling’s goal been allowed to stand, who knows how many more the Reds could have added? The loss dropped Liverpool to fourth, three points behind leaders Arsenal. Liverpool were Webbed, to put things plain and simply. Samuel Eto’o should have been sent off early in the game and should, therefore, never have scored the winner. Howard Webb also ignored a clear foul on Luis Suarez inside the box in the second half as the Reds chased an equaliser. Liverpool deserved at least a point from the match. The loss meant that the Reds dropped to fifth, eight points behind leaders Arsenal. This match will always be remembered for Kolo Toure’s poor pass that led to Victor Anichebe’s equaliser, but the annoying draw was as much due to the Reds’ inability to add to Daniel Sturridge’s first half opening goal. Clearly two points dropped; and at this point, the Reds were back in fourth but still eight points behind leaders Arsenal. I can understand Brendan Rodgers pushing his team on for more goals; but at 3-1 with Palace resurgent, a bit of caution could have been exercised. At 3-2, with Manchester City’s goal difference having become a moot point, the main concern should have shifted to preserving the win instead of trying to score more goals. Tactical fail, in my opinion. 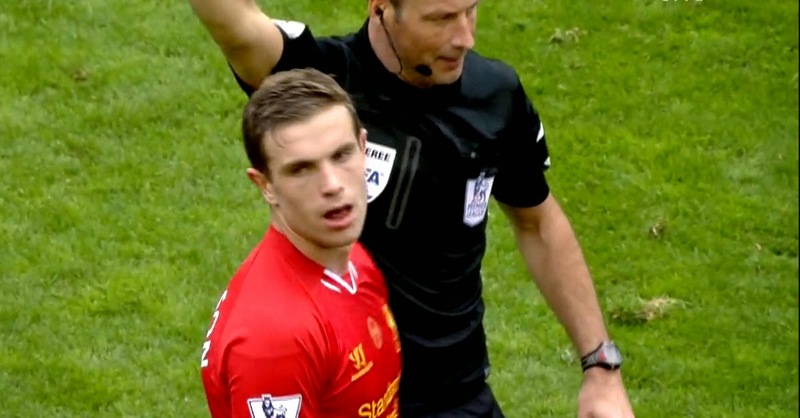 Henderson had been the Reds’ engine room all season long and had been their most consistent performer. However, he had been showing signs of fatigue in the few matches leading to the City game, when his lunge at Nasri was totally out of character. The home game against Chelsea, I believe, was also a tactical fail. Mourinho’s men had done a smash-and-grab at the Etihad earlier; and there was only one way that he was going to have his troops play at Anfield. I believe this match should have been approached with more caution.